In our selection of recipes for winter baking we include cranberry pie, muffins and a fresh twist on old-fashioned upside-down cake. We’re using seasonal fruits in these recipes but they can be adapted to make use of whatever fruit – or for the muffins, dried fruit or chocolate chips – that you have available. Homemade muffins accompanied by a steaming mug of latte or a glass of fresh milk make a wonderful elevenses or after-school snack. Cranberry pie served with dollops of fresh whipped cream makes a delicious pudding on a cold winter’s night, while upside-down cake can be served as a dessert or as a cake. If serving at the end of a meal, provide fresh single cream or warm custard to pour over it. Divide the pastry into 2 and roll out one piece to line a large (9”) deep tin. Roll out the remaining pastry and cut into strips about ½” wide. Set aside while you prepare the fruit. Peel, core and thinly slice the pears. Wash the cranberries and place in a bowl with the pear slices, sugar, cornflour and salt. Mix. Pile onto the pastry base and level. Dot with the butter. 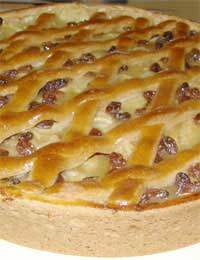 Weave the strips into a lattice across the top of the pie. Using the beaten egg to stick the eggs down. Brush the beaten egg over the lattice and cook for about 1½ hours or until the pastry is golden and the fruit is soft. Cover with foil if it looks as if it’s getting too brown. Serve warm with toffee ice cream or thick cream. Holding the sieve high above the bowl, sift the flour and salt. Dice the margarine into the flour and then, using your fingertips, rub in until it resembles fine breadcrumbs. Add water and, using a spatula, mix until it begins to stick together. Add more water as necessary. Then use your fingers to lightly pull the dough together. Wrap the dough in clingfilm and leave in the fridge for 20 minutes to rest. Use as required. Too much handling isn’t good for pastry. The colder the better when you’re making pastry. Pre-heat the oven to 200ºC, gas mark 6. Prepare a 12-cup muffin tin. Sieve together the flour and baking powder. Stir in the sugar, cranberries and chocolate chips. In a separate bowl mix together egg, milk and oil. Pour the liquid ingredients into the dry and stir until just combined. Half-fill the paper cases. Mix the sugar and cinnamon together and sprinkle on top. Cook for about 15–20 minutes or until well-risen and golden. Pre-heat the oven to 200ºC, gas mark 6. Grease the base of an 8” non-stick pan. Melt the butter in a frying pan. Add the sugar and stir until dissolved and beginning to caramelise. Stir in the lemon juice and then toss the pear halves in the mixture. Heat through. Arrange the pear halves, cut-side down, in the base of the tin and pour any left-over caramel over. Beat the margarine and sugar together until light and fluffy. Sieve the flour and baking powder together and gradually beat into the creamed mixture. Stir in the beaten eggs to make a batter. Spoon over the pears and bake for 10-15 minutes until golden and risen. Turn out onto a serving dish to take to the table. Serve with thick whipped cream or vanilla ice cream.